To help debug any issues you might encounter when integrating BotDetect Classic ASP Captcha in your Classic ASP forms, BotDetect includes a simple troubleshooting helper. You can also see how it was implemented in the Captcha troubleshooting code sample included in BotDetect Classic ASP installations. Copy the BotDetectDebug.asp file from your BotDetect ASP Captcha installation folder to your application root (where you copied the BotDetect.asp file earlier). Display the result of the Captcha object Troubleshooting function on your form. The file that needs to be copied is located at C:\Program Files\Lanapsoft\BotDetect 3 CAPTCHA Component\Asp\CaptchaLibrary\BotDetectDebug.asp by default. It's not recommended to copy this file to your ASP application unless you are currently debugging, and it should be deleted or moved to a protected location afterwards. 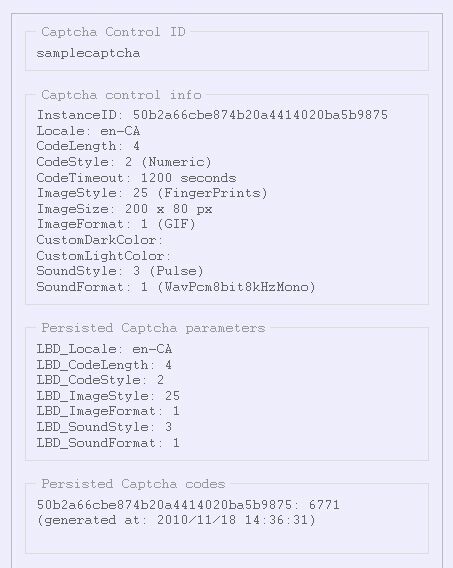 While this file is located in your ASP application folder and available to web visitors, it could potentially be used by malicious visitors to bypass any Captcha protection, since among other details it also displays the persisted Captcha codes. We'll explain the displayed troubleshooting information in the next section. This is the identifier you gave to the Captcha object when placing it on the form. If you have multiple Captcha objects placed on different forms within the same ASP application, they should have different Captcha ID values, since all Captcha information is persisted using the normalized Captcha ID value as key ("samplecaptcha" in the screenshot above). Non-Ascii characters and case are ignored when normalizing Captcha ID values for persistence purposes, so you should avoid using non-Ascii characters and character case to distinguish between Captcha objects. This section displays current Captcha object instance properties. Each Captcha object instance has an auto-generated unique identifier, which is used to store Captcha codes for separate page loads. This enables Captcha validation to work properly when the form is open in multiple browser tabs at once, for example. These are the effective parameter values for the current instance – values configured in the BotDetect\CaptchaConfig.asp file are used as application defaults, and values set in ASP form source are used to override these defaults. The combination of those two sets of values is the actual state of the Captcha object, displayed in the "Captcha control info" section of troubleshooting output. If you choose the image style randomly from 10 possible values, one of them will be chosen when the Captcha object is created on page load, and displayed for troubleshooting. Since the Captcha image is loaded in a Http request separate from the main form access, a new Captcha instance will be created then, and the image style used for image generation will be chosen again from all possible values. Since application default Captcha parameters are kept in the BotDetect\CaptchaConfig.asp file as explained above, we need to keep ASP form overrides for each Captcha object in ASP Session state. As you can see in the screenshot above, only those values that differ from the application defaults are actually kept in Session state. These are the actual Captcha codes, stored in ASP Session state. Each code also keeps track of its generation time, to allow setting Captcha code timeouts (so the Captcha can only be validated within 5 minutes, for example). Reloading the Captcha image (using the reload icon) changes the Captcha code and refreshes the timeout, while re-using the Instance ID. Validating the Captcha (successfully or unsuccessfully) deletes the Captcha code (you will notice the Instance ID for the validated code disappearing from the list) and generates a new instance (with its own Captcha code) on page reload. Reloading the page without submitting it (or opening it in a new browser tab) adds a new Instance ID to the collection, while keeping the old ones intact. This allows cross-tab validation to work, and each form access to be properly recorded for Captcha purposes.